Three Cubic Feet is available as an ebook and in paperback! Buy it here! Read what UK writers D.D. Johnstone and Tyler Keevil say about the book here. Three Cubic Feet was a finalist for the 2012 Lambda Literary Award in Debut Fiction. Letitia Moffitt wrote about Three Cubic Feet and a few other indie books at Paper Darts. Roxane Gay picked Three Cubic Feet for her Reading Roundup, Fall 2012. Jill Renae Hicks wrote a fantastic article about Three Cubic Feet in Columbia Daily Tribune September 23, 2012. Yes, I did write most of this book at Uprise Bakery in CoMo. Tim Deters, a student at Eastern Illinois University, talked with me about Three Cubic Feet. The Daily Eastern News ran his article on August 27, 2012. Check it out here. Mark Laughlin reviewed Three Cubic Feet on June 26, 2012, for Smile Politely, an online arts & entertainment magazine in Champaign-Urbana, Illinois. He interviewed me about the book and how I wrote it. He asked excellent questions about my process and how I developed the characters. 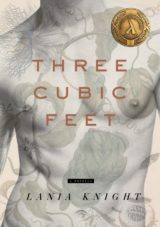 Shelly of Shelly’s Bookstore, an online LGBT literary blog, reviewed Three Cubic Feet on May 21, 2012. She says, “Knight’s background in writing shines here. She makes none of the mistakes many first time novelists make. She keeps the book short at 137 pages by not trying to say too much but she certainly says “enough”. You won’t feel that she’s missed anything with this story. It’s what my grandmother would have called “spot on”. Though there are a dozen or so periphery characters around our two main characters, they all add to the story without overwhelming the reader with people and points to remember – a mistake often made by 1st timers and one of my pet peeves. The writing here is tight and focused.” Read the entire review here. Film editor Ben Zweig made a video for Three Cubic Feet… check it out below. Three Cubic Feet is a story about the body–how it can be broken, how it can be violated and sometimes used to violate others. And yet, we go on. We heal, and life continues. Theo Williamson lives in Springfield, Missouri, an oppressive town hostile to change–no place for a gay teenager. His family has good intentions, but his father is recovering from a car accident, and his step-mother won’t give him a moment to himself. And Theo has guy problems. The closeted older man he seduced wants nothing to do with him, and Theo’s best friend Jonathan isn’t interested in anything more than friendship. When Jonathan’s father turns violent, Theo must decide how far he is willing to go for love.